Theranos and the EPO‘s top-level management are a good pair; corruption and fraud are becoming such a banal thing to be merely covered up, not tackled. Those who blow the whistle or complain politely are being punished and information about scandals is not being published. Media plays a role in the so-called ‘conspiracy’ (of silence or of PR). In the case of the EPO, it actively served to legitimise this scam. Battistelli is in some ways like Elizabeth Holmes, only a lot older. Theranos has been hitting the headlines again recently. 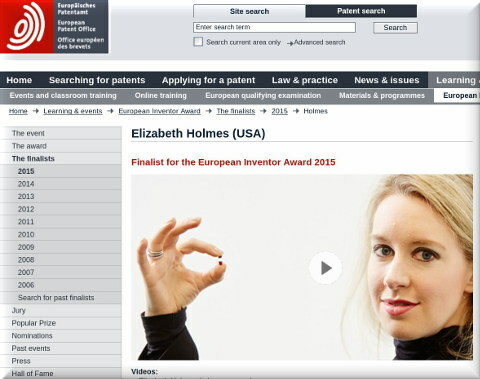 In the meantime it seems that the EPO has been busy trying to distance itself from its previous association with Theranos founder Elizabeth Holmes who was a finalist in the European Inventor Award in 2015. Important note: The nomination of Elizabeth Holmes for the European Inventor Award was put forward in 2014, and her selection as a finalist announced in April 2015. The nomination itself and material produced about Ms Holmes were based on the information available at that time. Serious concerns about the technology and its purported benefits have surfaced since then. The document is downloadable in Word format and in the file metadata the author is named as “Philipp Nisster”.